Intel’s fourth generation Core processor architecture has been the talk of the town thus far at this year’s Intel Developer Forum despite the fact that it won’t be ready for consumer use until sometime next year. There’s a lot to look forward to as Haswell promises to focus on reducing power consumption and increasing performance, a mission that Intel says is especially true for mobile chips. The next generation processor will be built on the same 22nm manufacturing process as Ivy Bridge but with a multitude of improvements. For one, Intel will be merging the CPU and the PCH (platform controller hub) which will result in huge power savings. Current Ivy Bridge ultra lower power processors have a thermal design power (TDP) rating of 17 watts. 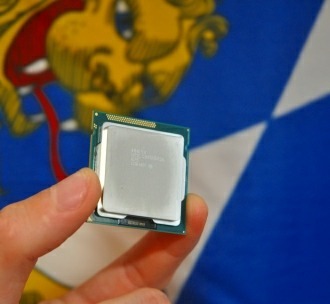 With low power Haswell chips, Intel is aiming to bring that number down to just 10 watts for use in select Ultrabooks. It goes without saying that such a dramatic drop in TDP will go a long way to increasing battery life while at the same time reducing heat and overall system thickness in future notebook computers. But the benefits of Haswell don’t end there; Intel says their next generation chip will include new instruction sets that will allow for faster encryption as well as deeper security measures embedded within the hardware. This is in addition to the increased overall performance the architecture is expected to deliver compared to current generation processors. Interestingly enough, Intel is also planning a new brand name for these ULV Haswell chips with “Core” being a contender for the brand.